The concept of the external engine mount bracket, or drive, has been around for a long time. 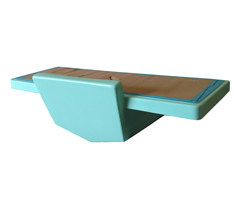 Back in 1973, Dusky fashioned the original DUSKY DRIVE out of fiberglass covered wood. In 1983 they brought in a wave of excitement to the industry with the introduction of their first all-fiberglass models at the Miami International Boat Show. In 1993, it was updated yet again to include a full swim/casting platform. Since that time, they've been copied by many companies that make brackets of various materials. At Dusky, we know better than to tamper with success. We still make our one piece, state-of-the-art drives from fiberglass - a most sea-kindly, resistant material which doesn't pit, rust or corrode. The Dusky Drive gives owners a safer, quieter and drier ride. We know you want more room for passenger and gear. 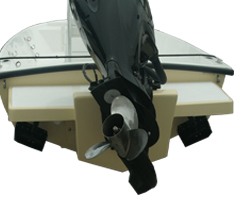 That's why the DUSKY DRIVE allows the outboard engine to be mounted on an external fiberglass platform, which is securely bolted and epoxied to the transom. With DUSKY DRIVE installation, no cockpit space is wasted on inboard or sterndrive engines, hatches, splash-wells, or lines and cables. Boat owners will enjoy more cockpit space than ever before. Up to almost two full feet of extra space! The DUSKY DRIVE also revolutionized engine performance and fuel efficiency by mounting the engines higher and farther back. Boat owners will save gas by being able to run at higher speeds at the same R.P.M.. Enhanced maneuverability and responsiveness allow owners to pour on the coal and leap from a standing start without fear of drowned engines from the old surge of water between engine and transom. 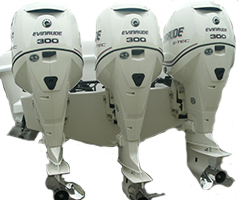 The boat can back down easier and turn sharper with far better control than with conventional engine mounts. DUSKY DRIVE also eliminated tilt limitations, so you can help protect your engines from corrosion by keeping them entirely out of the water. 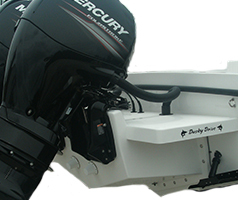 With DUSKY DRIVE, you'll soon forget the fear of bouncing off the splash-well into your boat in a following sea. You won't have to worry about wallowing in several inches of water whenever you back up. Since water cannot churn up between transom and engine, cavitation can become a thing of the past. 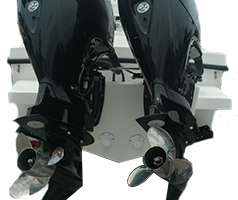 With the motor outside the boat behind the full transom, your vessel will be quieter. 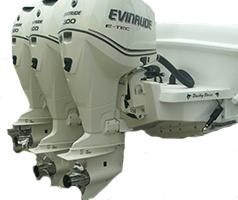 With the ability to mount the DUSKY DRIVE on nearly any boat, regardless of make and compatibility with all outboard engines (single, twin and triple engine configurations), the DUSKY DRIVE is a solid choice for anyone looking to repower or even just upgrade their performance numbers.